Glaucous Gull at Boonton Reservoir, found and photographed by Julie Buechner. Daylight ended on the first day of 2014 with a Glaucous Gull, found by Julie Buechner , roosting on the ice at the north end of Boonton Reservoir. Even at a distance, the Glaucous Gull stood out among the 300 pale gray Ring-billed and Herring Gulls. Most of the gulls were elsewhere during the morning and early afternoon. Earlier in the day, the south end of the reservoir had 143 Common Mergansers, 2 Red-breasted Mergansers a handful of Buffleheads, one or two Ring-necked Ducks and Scaup sp. and that is all. The morning saw most of the reservoir covered in a paper-thin sheet of ice. This melted by Glaucous Gull-time later in the day except for hard-core freezing in the corners and edges of the reservoir. It is a pleasure to see Lake Hopatcong, New Jersey’s largest lake, receiving more attention from birders. It is a major untapped birding resource in North Jersey, at least in autumn, winter and early spring. In other words, until all of the boats come out of dry dock. Tundra Swans – 5, same general location as the previous day off Nolan’s Point. Ring-necked Duck – 293 at Bertrand’s Island. Greater Scaup – 2 hens, an excellent species for Morris County where Lesser Scaup are prevalent. Greater Scaup, Lake Hopatcong, NJ, Jan. 1, 2014 (digiscoped by Jonathan Klizas). 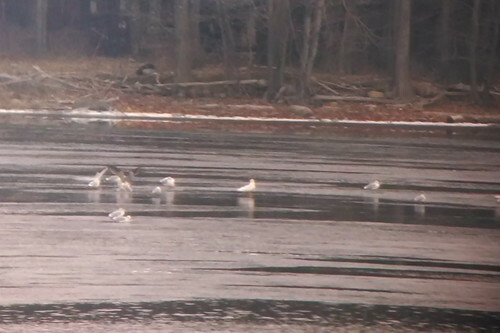 Great Black-backed Gull – 54, the highest known tally ever in Morris County. 50 were counted on Lake Parsippany in 1984. All data are sourced from eBird. Lesser Black-backed Gull, Lk. Hopatcong, NJ, Jan. 1, 2014 (photo by Jamie Glydon). The birds were observed at different times of the day. The Great Black-backed Gull count was early in the 17-degree-Fahrenheit morning. All of the gulls became aloft and went elsewhere as one of the resident Bald Eagles cruised by (J. Klizas). The Common Goldeneye was seen later in the morning (Simon Lane). The Long-tailed Ducks and the Lesser Black-backed Gull were found in the afternoon (Jamie Glydon). Vultures, mostly Black, at Greystone, NJ, Jan. 1, 2014 (photo by J. Klizas). In Somerset County, the 6 Sandhill Cranes of Franklin Township continue to be viewed at various locations along Randolph Road. At least 2 Red-headed Woodpeckers are at Colonial Park (John J. Collins) and 1 at Duke Farms (Jeff Ellerbusch).